Now I know what a BMT is, but who needs one? What are the reasons for a bone marrow transplant? The many different types of cells in the blood are all produced in the bone marrow, a spongy substance in the centre of most bones. 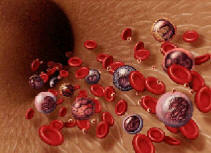 'Stem cells' develop in the bone marrow and mature to produce the different cells of the blood. If a person's bone marrow is destroyed (as a result of cancer, for example) and the cells within it die, no new red or white blood cells can be produced. This causes the person to develop anaemia (lack of red cells) and the person is more vulnerable to infection because of lack of white blood cells. This is invariably fatal. Bone marrow transplantation was originally used exclusively as a treatment in advanced stages of leukaemia and lymphoma (both cancers of white blood cells). Nowadays, it is used to treat other cancers and many more illnesses too. Leukaemias and lymphomas originate in the bone marrow itself. They are generally treated with chemotherapy (drugs that destroy the cancerous cells) but this also temporarily suppresses the bone marrow cells, without destroying them completely. However if this is unsuccessful or if the illness returns after treatment then a bone marrow transplant may be required. Aplastic anaemia is another condition that requires a bone marrow transplant if it is very severe or if treatment does not work. This is the illness that Yvette, the inspiration for this campaign, has and in her case the treatment was unsuccessful. There are plenty other illnesses (over 70 in fact) that may require a bone marrow transplant to treat and more about these can be found on medical websites.